Imagine an 11th-century palace filled with beautiful antiques and frescoes, surrounded by fragrant lemon groves, and perched high on a cliff above the Mediterranean sea. It's not a dream - it's an actual place and it is heavenly! Hotel Caruso, also called Belmond Hotel Caruso, sits on the edge of the hilltop town of Ravello, on the Amalfi Coast in Southern Italy. With lush gardens, sun-drenched terraces, and even a stone Cappellina, a tiny chapel, the hotel is the ultimate luxury location for an Italy destination wedding. This photo was taken after the couple finished taking some portraits on the infinity pool at the hotel and were about to head to the terrace for the reception. I love the reflection in the water, the pinkish-purple hues of the sun setting behind the Sorrentine hills, and all the detail of the bride's custom designed Ilana L couture gown. Sometimes it is these little in between moments that are so stunning! 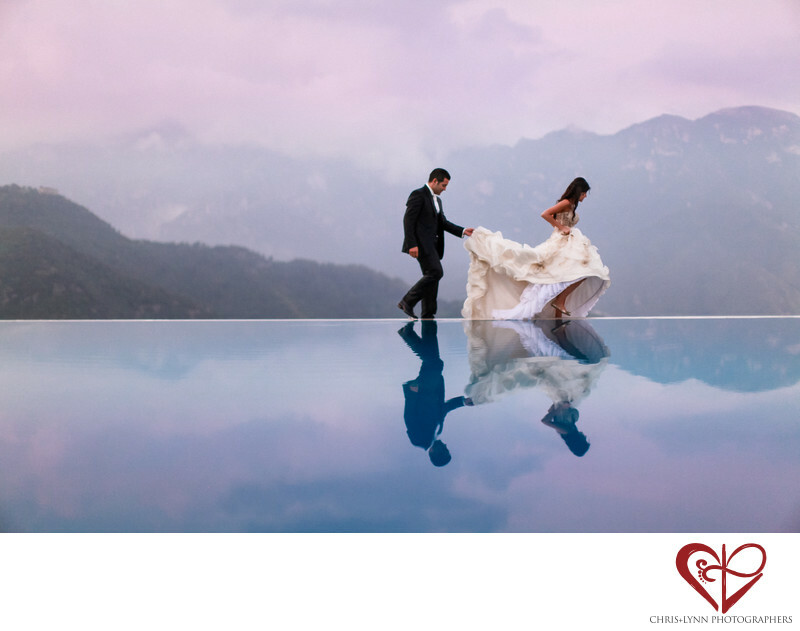 From a wedding photographer's viewpoint, Ravello is the most incredible location on the Amalfi Coast for a wedding. Its location 365 meters above the Tyrrhenian Sea gives it an intimate & secluded feeling quite different from the tourist-crowded streets of Positano & Amalfi. The quaint village also offers a wonderful variety of locations for wedding photography, ranging from the 13th-century Moorish-style Villa Rufolo to the posh 11th-century Villa Cimbrone. View more Amalfi wedding photos in our featured wedding Ravello wedding at Villa Caruso here. Location: Belmond Hotel Caruso, Parco Regionale dei Monti Lattari, Piazza S. Giovanni del Toro, 2, 84010 Ravello SA, Italy. 1/1600; f/1.2; ISO 800; 50.0 mm.